So last year for my birthday some friends put up a pergola for me. 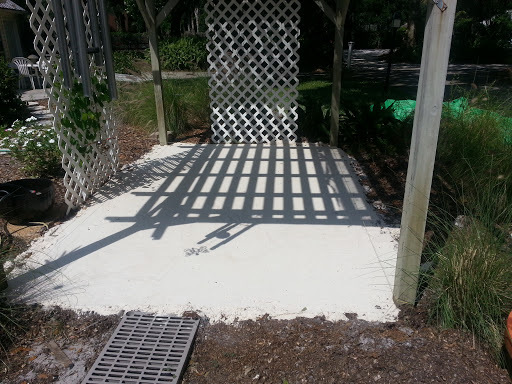 I learned that “pergola” in Florida cracker language is “shade shed” which kind of tells you what it is. I think I put up pictures of it being built. I’ve enjoyed most everything about it for the last year except the way my feet tracked dirt and mulch from there into the house every time I visited it. It had a floor like the rest of the garden it is in – dirt and leaf mulch, or rather we could say it never had a real floor. I got so tired of the mess that I covered it up with an old carpet which worked pretty well but looked very trashy. And embarrassing. 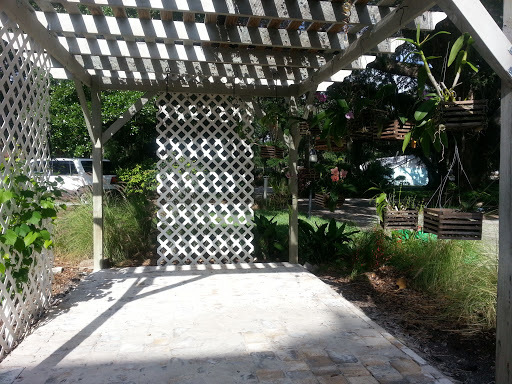 So this year for the pergola’s birthday my project was to give it a proper floor. I was gifted with some money for my birthday which I figured would be just about right to do the job. I knew (or thought I knew) the pavers would be the expensive element so I visited three different paver suppliers and was able to make a choice. Note for future: when buying pavers, know that the final price will include transportation of some kind because a pallet of pavers is HEAVY. Even if you haul them yourself to your house, the supplier will likely add on a charge to pay for their transportation costs to their yard. 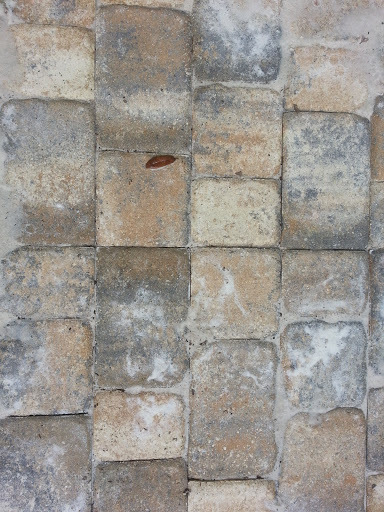 From what I had read I knew that the right way to put down pavers was to lay a foundation of sand that can be leveled. I was pleased to find that sand/silica is not that expensive. But it took quite a bit of sand for my 8×12 foot floor. One load was not quite enough. I hauled it myself in our truck. I shoveled both loads off by myself and thought of it as upper body workout time. And suddenly I knew I needed help because I was at the end of knowing exactly how to proceed. Enter Joe, my helper. Somehow I had forgotten about this necessary cost of putting down the floor. Joe came several afternoons and placed the sand. and leveled and smoothed the bed before the pavers arrived. Note for future: try to have pavers on site, ready to go, so animals do not use your finely smoothed sand for a litter box. Joe spent several other afternoons figuring out a pattern for the pavers and carefully laying them, cutting some of them for the corners. And then, from his previous experience, Joe told me that I needed to keep the edges in place by putting down a cement anchor. Little sacks of cement needed – one for every two or three feet. I just looked at him. Really? Let’s think of another way even if it’s not quite as good. That’s called Shirley-style. We turned the left over pavers on their side and buried them deep enough to anchor the edge, a little. I still need some cement on one side. I have lost track of how much time Joe has spent so far. I may have to take out another mortgage on the house to pay him. Note for future: make sure DIY projects can be done by self and that you WANT to do them yourself. It’s nearly done now. I have to wash some sand down in the cracks between the pavers and put a couple stepping stones down on the path and then decorate! And enjoy! It’s summer here almost and it will be beautiful. Bet you all wish you had a pergola, right?